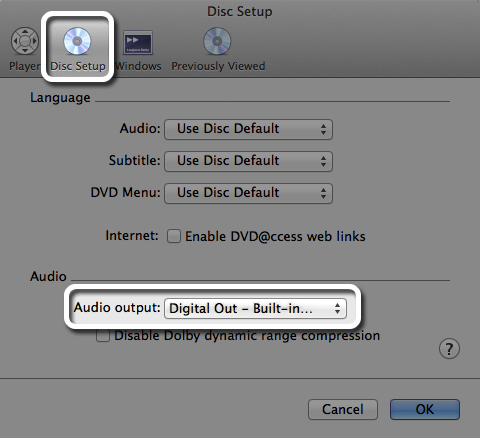 To play movies that contain digital surround sound audio on your Mac, you can use DVD Player or iTunes. Follow these steps to set up your Mac for surround sound playback. Movies you purchased or rented from the iTunes Store may have stereo audio and digital surround sound tracks. In iTunes 11 and later, digital surround sound is selected automatically. If you want to experience the digital surround sound, you need to connect your Mac to a home theater receiver using a TOSLINK (optical digital audio) or HDMI cable. In iTunes, click the Speech Bubble icon to view your audio choices, such as English (Surround). If the surround sound choice is dimmed or the icon doesn't appear, make sure you are using the appropriate hardware and that the content is encoded with digital surround sound. Open DVD Player (from the Applications folder or by inserting a movie disc). Choose DVD Player > Preferences. Make sure that only one playback app is trying to use digital surround sound at the same time. Click the Output pane. You can also adjust the balance control and overall volume in the Output pane. If your media has surround sound, but it isn't playing in surround sound, try connecting a surround sound-compliant AV receiver between the Mac and the speaker hardware (using the appropriate digital connector) to rule out decoding issues. If you hear audio play through the internal speakers only, you need to change your output setting to the surround sound device. If you use iTunes to play Dolby Digital content, it may output audio through the surround sound speakers automatically. If some speakers play most of the surround sound audio, you may need to adjust the balance control to the center position. The LFE (or subwoofer) may not always play audio when the other speakers do; this is expected behavior since that speaker is only designed to play low frequency sounds that may not always be present. Digital surround sound is the result of multichannel digital audio and data compression technology, such as Dolby Digital, that enables the use of more than one channel of sound output over a single connection. Not all music and movie content is encoded with surround sound when it's produced. Examples of content that's frequently encoded with surround sound are DVDs and movies purchased or rented from iTunes. When music and movies aren't encoded with surround sound, their sound will play as conventional two-channel stereo instead. Digital surround sound playback usually uses a 5.1-channel home theater receiver to decode the multi-channel audio, reproducing the surround sound experience. There are many versions of digital surround sound. Most versions are based on a five-channel (or speaker) surround sound setup. This consists of a left and right front speaker, a left and right surround (rear) speaker, and an LFE (or subwoofer) speaker.